Caution: avoid shopping or important decisions from 7:15 AM until 7:15 PM EDT today (4:15 AM to 4:15 PM PDT). After that, the Moon moves from Sagittarius into Capricorn. This is a poor day to sign important papers, especially related to finances, wills, inheritances, insurance issues and your partner's wealth. It's also a poor day to negotiate. Get your information. If spending money, restrict your outlay to gas, food and entertainment. Although this is not a good day to spend money or make important decisions, it's a good day for a heart-to-heart talk with a partner or close friend about genuine, honest issues. People will be inclined to let their guard down and really tell it like it is. Your efficiency at work will suffer today (along with everyone else's). That's because for most of this day it's a Moon Alert. Don't spend money on anything other than food, gas and entertainment. Don't volunteer for anything or make an important decision. This is a great day for creativity and exploring artistic options because your imagination can soar and entertain new concepts or see ways to put a new spin on things. However, spend money only on gas, food and entertainment. This is a poor day to buy real estate or something costly for your home - nevertheless, it's a great day to entertain. If you don't entertain, you can enjoy cocooning at home watching daytime TV and eating Ben & Jerry's. 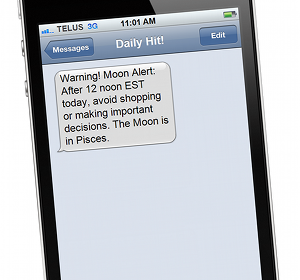 This is a loosey-goosey day because today's Moon Alert affects your daily routine, daily transportation plus your everyday conversations. Don't volunteer for anything. Don't agree to anything important. Don't sign important papers. Restrict spending to gas food and entertainment. Write down your ideas. This is a poor day for business and commerce or making important decisions. Don't spend money on anything other than food, gas or entertainment - this includes buying a company, let alone smaller purchases of thousands of dollars. Just fill your databank. For most of this day, it is a Moon Alert and it's taking place in your sign! In one way, this will make you feel adrift, vague and loosey-goosey. But in another way, you will feel relaxed and enjoy socializing with everyone. (It's a great day to play hooky.) Confine spending to gas, food and entertainment. Enjoy schmoozing with others. For those of you who like to explore your inner world through meditation, yoga or a contemplative walk in the forest - this will be a rewarding day. However, if you want to keep to your routine and make important decisions, you will be frustrated. Check the Moon alert above. This is a great day to enjoy the company of others and also to interact with clubs, groups and organizations. People will be happy to see you and vice versa. People will be keen to build on each other's ideas. However, wait until tomorrow to agree to anything important. The Moon Alert today takes place at the top of your chart, which means do not volunteer for anything with bosses, parents and VIPs. Do not agree to anything important. If you're asked to do something, double check every angle to make sure you are on the same page. Poet-playwright William Shakespeare (1564- 1616) shares your birthday today. You have good business sense and strong family loyalties. You are insightful, well spoken and productive. This is a fun-loving year! Enjoy increased popularity and warm friendships. This year you will be more grateful for your life and will appreciate the happiness and beauty around you in a daily way. You will make an important choice -- choose wisely.